The Honda Accord continues to be the benchmark for midsize sedans while offering something for everyone, such as hybrid and coupe variants. The 2015 honda accord hybrid electric vehicle qualifies for a federal tax credit of up to $7,500, effectively reducing the net base price. Think about a Honda and an Accord will likely come to mind. For nearly four decades the Accord has been a staple for the automaker and a standout among rivals. In the process it has matured from a tiny 2-door hatchback to a full-featured family sedan and sleek coupe brimming with features. Today, the 2015 Honda Accord continues to set the standard in a segment that's crowded with rivals like the Toyota Camry, Ford Fusion, Chrysler 200 and Nissan Altima. Still fresh off a recent revamp that blessed it with new design and more efficient powertrains, the 2015 Accord also continues to offer its something-for-everyone appeal with easy driving manners and a broad lineup that ranges from a sub-$23,000 family sedan to a premium-quality hybrid. Simple operation, great reliability and high resale value are obvious attractors to the Accord. But you may be surprised at the extent of its lineup, which ranges from an economical sedan to a V6-powered coupe or a hybrid rated up to 50 mpg. It's hard to go wrong in any of them. About the only boxes the 2015 Honda Accord doesn't check are all-wheel drive or diesel power. Need those features? Look to the Subaru Legacy, Ford Fusion or Chrysler 200 for the traction enhancement all-wheel drive provides, or the Volkswagen Passat for the high-mileage a diesel engine grants. Only minor changes are due the 2015 Accord. The HomeLink remote system is now standard in EX-L and EX-L Navi trims of the sedan and coupe, as is the LaneWatch side monitor in the EX Coupe. Honda has yet to announce whether the limited-availability plug-in hybrid Accord will return for 2015. With the Accord's various powertrains come different driving experiences, but most buyers will gravitate toward 4-cylinder models with an automatic transmission. Used in this setup is a continuously variable transmission (CVT), and it's surprisingly refined. The Accord's CVT feels much like a normal automatic, mimicking gear changes. Even a base sedan has good power for acceleration and passing, yet attains up to 36 mpg on the highway. Ride quality is pleasing, with a smart balance between comfort and sportiness. Honda Accord sedans and coupes with the 278-horsepower V6 are downright quick. The Accord Hybrid sedan, meanwhile, offers an easy way to earn exceptional fuel economy. Its transition from gasoline engine to electric power is smooth. The only obtrusion we experienced from the hybrid was a whine from the electric powertrain likely to be heard only by canines and human passengers whose ears can still sense higher frequencies. Get behind the wheel of this Honda and, if it weren't for its aversion to gas stations, you might not realize you're driving a hybrid. In addition to appearing nearly identical to the regular Accord, the 2015 Accord Hybrid drives similarly, with transitions between its gasoline engine and electric motor nearly imperceptible. Step into the latest Honda Accord, and its 5-passenger cabin will feel familiar yet sophisticated. The familiar part comes from its roominess, excellent outward vision and easy-to-reach controls. Among the nicer touches is a standard 8-inch screen that sits prominently in the dash to relay audio, phone and navigation information. EX-L models and higher have a secondary screen for touch-operated audio and Bluetooth wireless streaming. The front seats are supportive and comfortable. Rear seats in the sedan are roomy for two adults (three in a pinch) and – not surprisingly – tighter in the coupe. Over the past few years the midsize sedan segment has become something of a beauty contest. We've seen prominent grilles, swoopy body creases and elongated headlight housings stretched farther than string cheese. Some of the designs look great upon introduction but age quickly. The 2015 Accord sedan bucks the pursuit of trendiness in favor of more contemporary lines. It may not be the flavor of the month, but the 4-door Accord sedan remains handsome and will likely age well. The 2-door Accord coupe brings added visual appeal with its forward stance, sloping roofline and arrow-like rear-window treatment. Even if you spend the least on a 2015 Honda Accord LX sedan, you'll get a well-equipped car with an 8-inch color display with rearview camera, dual-zone climate control and a 160-watt AM/FM/CD stereo with Pandora, Bluetooth connectivity and USB input. Sport models get a power driver’s seat, 18-inch alloy wheels and a slight power increase. EX models include a power moonroof and the LaneWatch system, while EX-L models gain leather seating, upgraded audio, heated front seats and lane-departure warning. Top-line V6 Touring models have forward-collision warning and adaptive cruise control. 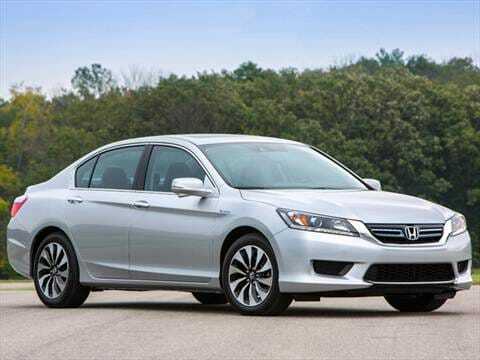 Hybrid Accords include LaneWatch, LED daytime running lights and a 10-way power driver's seat. With the exception of opting for an automatic transmission in lower models instead of a 6-speed manual, major options for the 2015 Accord are obtained by moving up trim levels. Among the most desired features are satellite navigation, the V6 engine, a 7-speaker/360-watt audio system, 18-inch wheels, leather seating, the multi-angle rearview camera, HomeLink remote system, LED headlights, blind-spot display and adaptive cruise control. Accessories for further personalization include a sport grille, underbody kit, rear spoiler, remote engine-starting unit and illuminated doorsill. Two engines and three transmissions are offered in gasoline-powered versions of the 2015 Honda Accord. The base engine is a 2.4-liter 4-cylinder that makes a healthy 185 horsepower (189 in Sport versions). Optional is a 278-horsepower 3.5-liter V6 that makes the Accord surprisingly quick. In the sedan, 4-cylinder engines are linked to a 6-speed manual transmission or CVT automatic, while V6 engines use a 6-speed auto. In the coupe, the V6 can be connected to a satisfying 6-speed manual. The hybrid, available as a sedan only, uses a 4-cylinder gasoline engine and electric motor powered by a lithium-ion battery. Fuel efficiency is a strong point for the Accord, with 4-cylinder models rated up to 36 mpg, V6s returning an admirable 34 mpg, and hybrids up to 50 mpg. The 2015 Honda Accord starts at a Manufacturer’s Suggested Retail Price (MSRP) of $22,895 for an LX sedan with manual transmission. The automatic transmission is an extra $800. At the other end of the spectrum, a 2015 Accord V6 Touring sedan starts over $34,000. Hybrid models range from roughly $30,000 to $36,000. At these prices, the 2015 Honda Accord is in line with key rivals such as the Toyota Camry, Nissan Altima, Ford Fusion and Chevy Malibu. Undercutting the starting price of Honda's family sedan are the Mazda6, Subaru Legacy, Hyundai Sonata, Kia Optima and VW Passat. Before buying, be sure to check the KBB.com Fair Purchase Price to see what others are paying for their new Accord. In the years ahead, the Accord is expected to have excellent resale value, evidenced by its win last year of the Best Resale Value Award among Mid-Size Cars. This is the best car, I have ever owned. All I can say is everyone should own one. It's an unbelievable car in every way. Gas price is not an issue any more. Ready for a new one. the best vehicle I've ever owned. Love Hondas, Reliable, Dependable, Durable. What can i say. Great vehicle, smooth driving car. Beautiful. This vehicle drives like a dream. Amazing technology. Lane Assist is incredible! This is the finest car I have ever owned. One of the best midsized cars Ive owned. Very reliable, comfortable and energy efficient.